Location: Within the Daybreak community, Oquirrh Lake is approximately 4500 west and between 10400 south and 11400 south in South Jordan, Utah. Directions: From Bangerter Hwy, turn west on either 10400 south or 11400 south. Continue west on either street until you arrive at the Lake. Site extras: Because of its unusual meandering shape, Oqurrh Lake is nearly one mile from the North Bay to the dam on the south end. 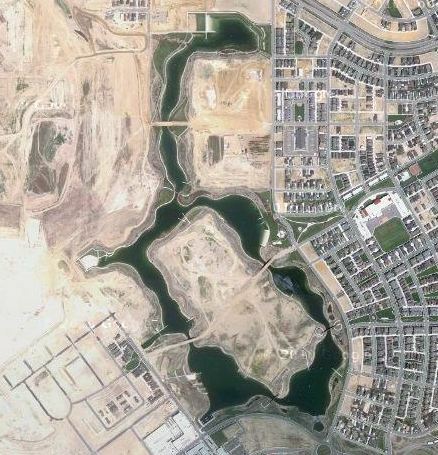 Oquirrh Lake features 67 acres of surface water, but above the shoreline, the beaches, docks, trails, grassy picnic areas, wetlands and natural habitat brings the project total to approximately 137 acres. Site rules: Boating is for residents only. Fishing is allowed on the perimeter of Oquirrh Lake. Fishing is not allowed on the island, which is only accessible by trail. Fishermen must use a valid Utah fishing license and abide by those regulations. Oquirrh Lake is an amenity in the Daybreak community. Special thanks to representatives of Daybreak for providing the above information.